Invoices, bank statements, feeds of public data… Painful though it can be, many business workflows need to be able to take data in from PDFs. PDFTables.com has had an web API for a while. 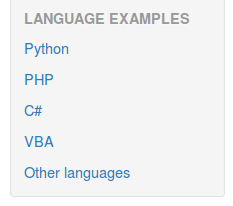 We’ve just added a few more language examples for C#, PHP and Visual Basic for Applications coders. You can find them on the API documentation page. Let us know if you build anything with it, or if you need an example for any other language!